2,221 backers pledged $172,264 to support this project on Kickstarter. Hank Willis Thomas, Love Over Rules (billboard), Nashville, TN, 2018. Image courtesy Clifford Pickett, Alyssa Meadows, and For Freedoms. How can artists spark honest dialogue and reflection about issues that affect them locally and nationally? That’s the question For Freedoms, an artist-led nonprofit, wanted to answer with the 50 State Initiative. Guided by Hank Willis Thomas and Eric Gottesman, For Freedoms and 2,221 Kickstarter backers worked from coast to coast to install artwork along some of the most travelled roads in the world in every U.S. State, Puerto Rico, and Washington, D.C.
Their work didn’t stop there: partnering with over 150 institutions and museums, For Freedoms helped facilitate artist-led town halls and exhibitions to ask what local, state, and national issues need to be raised—and how artists and their communities can respond, take action, and plan ahead. Guerrilla Girls, Dear Boss: No Wonder You Don't Pay Us A Living Wage (billboard), Oklahoma City, OK, 2018. Image courtesy David McNeese and For Freedoms. Trevor Paglen, Nov 6 (billboard), Hartford, CT, 2018. Image courtesy Eric Gottesman and For Freedoms. Christopher Myers, Mayflowers (billboard), Rockland, ME, 2018. Image courtesy Center For Maine Contemporary Art and For Freedoms. Marilyn Minter, SAD! (billboard), Little Rock, AR, 2018. Image courtesy Cindy Momchilov and For Freedoms. 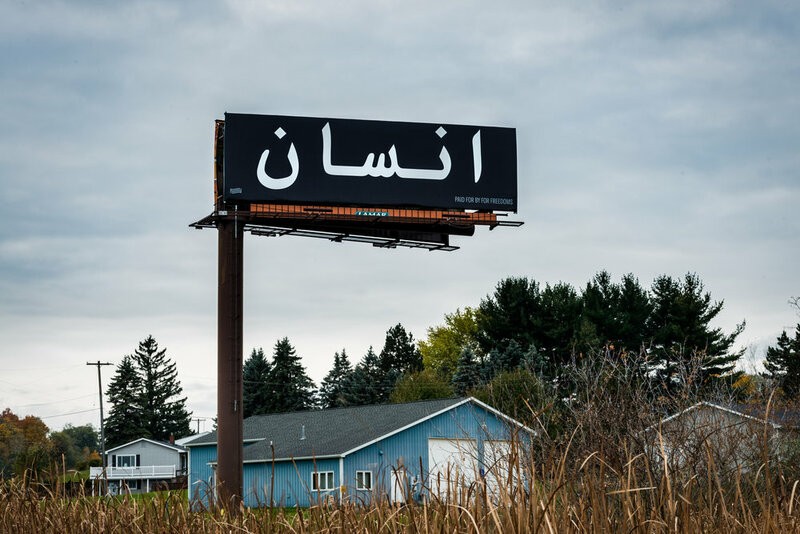 Jamila El Sahli, Human Being (billboard), Lansing, MI, 2018. Image courtesy Jeremy Rafter and For Freedoms. 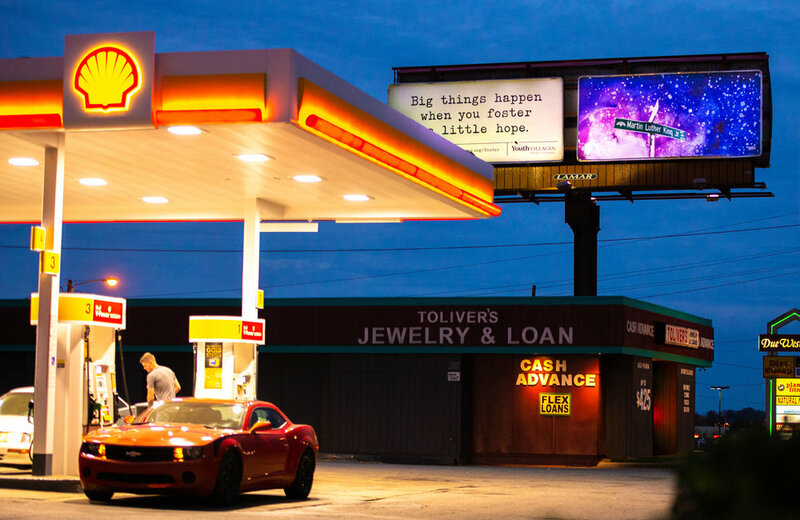 Sadie Barnette, Some Space (billboard), Nashville, TN, 2019. Image courtesy Clifford Pickett, Alyssa Meadows, and For Freedoms. 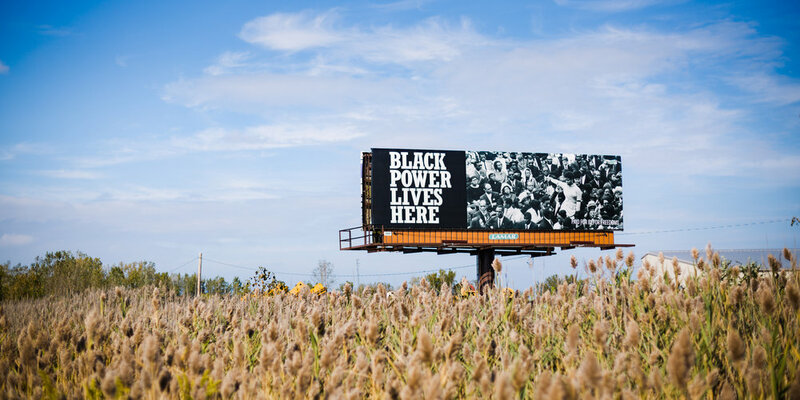 Theaster Gates, Where Black Power Lives (billboard), Gary, IN, 2018. Image courtesy Madeleine Thomas and For Freedoms. Wyatt Gallery, An Expensive Hoax (billboard), Olympia. WA, 2018. Image courtesy Loewyn Young and For Freedoms.